Experience Masai Mara in a new way, and rest right in the heart of nature in the Masai Mara National Reserve. Have yourself a great adventure and witness the beauty of wildlife in Kenya in the mornings, and when the day ends, you can rest surrounded by unadulterated views of the Mara. Whatever adventure you may be looking for, this trip can be customized to suit what makes you comfortable and satisfied. You will stay at the Elangata Olerai for this safari. Elangata Olerai offers an exclusive and unique concept in community guiding based on the expertise and first-hand experience of the local community's members to introduce you to landscapes, flora, and fauna that they intimately understand. Each of the 22 tents are set apart and linked by a paved walkway that winds through the unaltered local habitat. 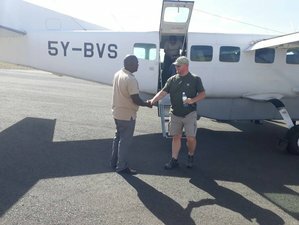 You will depart from Wilson Airport (WIL) aboard a scheduled flight to Masai Mara National Reserve. You will be met upon landing at the airstrip and transferred to the camp. Game drive and overnight at Elangata Olerai Camp on a full board basis. You have morning and afternoon game drives in the world famous national reserve, the Masai Mara. Famed for its spectacular annual migration. The game reserve has the highest population of lions in the world. You will stay overnight at camp on full board basis. You will prepare for an early morning game. You will then be transferred to the airstrip for flight back to Nairobi. This air safari will take place in Masai Mara, Kenya, Maasai Mara National Reserve is regarded as the jewel of wildlife viewing in Kenya. Situated in the Great Rift Valley, the reserve is primarily open grassland. The annual wildebeest migration involving over one million animals arriving from Serengeti can be seen here. The migrating animals are tracked by predators: lion, leopard, cheetah, and hyena, and circled by vultures as their journey unfolds. There have been some 95 species of mammals, amphibians, and reptiles and over 400 birds’ species recorded on the reserve. Breakfast, lunch, and dinner are included in this safari. Regular diet meal, like meat and fish, is catered but if you have special dietary requirements it is a good idea to communicate it when you make a reservation. Please book your flight to arrive at Jomo Kenyatta International Airport (NBO). Transfer from and to the airport is included. Dallago Tours Kenya Tanzania Ltd will pick you up from the airport.